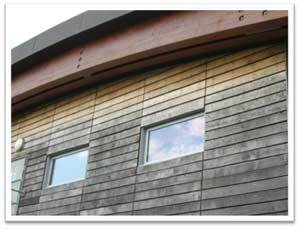 An alternative to using a coating system is to leave the wood unprotected so that it can weather and bleach naturally. Nearly all woods can be left unfinished, including our oak cladding, and can naturally be bleached into an acceptable finish, if this does come about then no further maintenance is required. There may be more movement in the timber because of the amount of moisture seeping into the wood (this may cause small cracks to appear). Polluted environments may cause the wood to pick up dust and dirt causing it to have a blackening effect on the wood. The amount of bleaching in the timber could be uneven due to different amounts of exposure e.g. a board in the shade will not bleach as much as something in the sun. Orientation also plays a major role in the amount of bleaching that takes effect on the timber. North, North-East and North-West elevations will take longer to bleach that South, South-West and South-East facing timber. When in close range of trees and fresh vegetation or in any other place where there is a high run off of moisture a coat of anti-fungal wash and a moisture resistant coating may be necessary to prevent the wood from blackening. These may need reapplication to keep their effectiveness. Another form of blackening is air pollution from exhausts so it is not recommendable to use unfinished wood in an area where you know there is a lot of pollution. Other pollutants such as brake dust from cars and trains can react with some timber and cause it to strain. Cleaning fluids are available to clean stained timber as well as to a certain extent bleached wood (These fluids won’t protect the wood from further discolouration in the future).